Did you make your assumption? Are you ready for the answer? 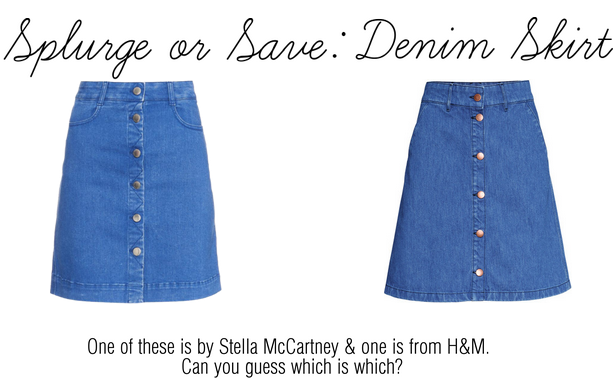 The Stella McCartney denim A-line mini skirt runs for $565 while the H&M denim skirt costs a seemingly measly $45. Stella's $565 skirt is on the left; H&M's $45 skirt is on the right. To be honest, I prefer the look of the Stella McCartney denim skirt; the pockets would be ever so useful. But there's no justifiable reason to purchase it when there's a nearly identical jean skirt for $500+ cheaper. Overall, I really love the look of both. H&M's skirt is perfect because it has just a little bit more flare at the hem to give you a slimmer look. I honestly could not tell which one was more expensive, they both look lovely. I would vote for 'save' this time! The left one looked more expensive to me. 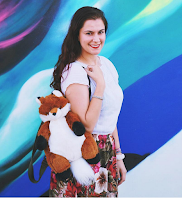 So cool that these skirts are making a comeback! Wow, great post, they both look pretty similar. Loving the denim skirt at the moment. I'm so loving denim skirts and dresses right now. I like the pockets in Stella ' but the H&M cut would fit my frame better. Now I'm about to get it! Lol Thanks for sharing! I guessed right...of course I chose the Stella McCartney skirt....WHY???? Wow! Both skirts are very cute:) perfect for spring! I can do h&m !! They look so similar!! Both of these are super cute! i can't even tell the difference! You are so right, they are truly identical in a lot of ways. I don't know which one I'd choose, but I love a denim skirt. Well I had them the wrong way round! I can't see why it has to be so much when they are the same? They are lovely! Both skirts look cute to me, but the H&M skirt looks even better funny enough. They look almost exactly alike! To be honest, I would definitely never ever spend five hundred dollars on a denim skirt! I knew the left one would be more expensive. I don't know how, but I just knew! I'd say I like the Stella one much better but there's an easy way out of the expense dilemma: save on the skirt (buy the H&M one) and have it altered afterwards! Look for less, done! I saw the one from H&M in store, that`s how I knew which one was the more expensive one. However, I like it more and I think the shape is more flattering than the one from Stella. I don`t normally wear denim skirt, but I`m obsessed with denim shirts. Wicked splurge or save find here Carmen!! I definitely cannot tell the diff between either. Also, my mom had this identical skirt from Guess back in like 1992. Dammit!! Why do I not keep her stuff. Cannot make out the difference between the two skirts. So definitely it's a "save" in this case! I guessed right! But I totally agree that it's not worth the money to buy a marginally better made skirt. I am pretty much out the door right now to pick up this skirt from H&M! Love it so much! What a find at H&M!! Good job!! Definitely the H&M one, I love A-line skirt because it suits me much better! I got a couple of super cute denim skirts at thrift stores! And I will never buy a name brand denim skirt again because of it. I love them. Oh my gosh this is crazy, I honestly couldn't tell the difference! oh wow, these are so cute but i would save... 565 is too much money for a denim skirt, no?! Wow, keeping an eye out for the H&M skirt - perfect for the 70s trend at the moment. Wow such a great post! That's crazy how similar they are. I am loving this style of skirt lately too! I actually like the right one a lot better. I like the way it flares out more than the Stella one. I was aaaalmost gonna get the skirt but I need to do some ab work before I do. It looks like the kind of skirt that fits really tight and snug and would look best with a tucked in tee. Great post!! I love both of them and honestly couldn't tell which one the more expensive is and I actually like the H&M one better. I honestly couldn't tell the difference, they both look great! Great post! Wow hard to tell the difference! Definitely an item to save on!